Abstract: Still the legendary reputation of Asus' quality lives on today, and whenever someone asks for a suggestion on any given peripheral, Asus' name is often thrown into the hat. Asus have been the market leader in just about every facet for as long as I can remember. And while it's true that their manufacturing quality was better than most a few years ago, the same really can't be said now as all teir one manufacturers have outstanding quality. Still the legendary reputation of Asus' quality lives on today, and whenever someone asks for a suggestion on any given peripheral, Asus' name is often thrown into the hat. Asus has been a manufacturing partner with nVIDIA for the longest time so it's not surprising that they were quick to adopt nVIDIA's ill fated GeForceFX 5800 Ultra (in fact it was the only GeForceFX 5800 Ultra available in Canada!) which was then dropped quickly. nVIDIA released the NV35 a.k.a. GeForceFX 5900 Ultra a few months later, but Asus didn't jump on the bandwagon as quickly as they had the first time. One can only assume that this change of heart was because Asus didn't want to sell rebranded nVIDIA/Flextronic FX5900 Ultra's like the rest. 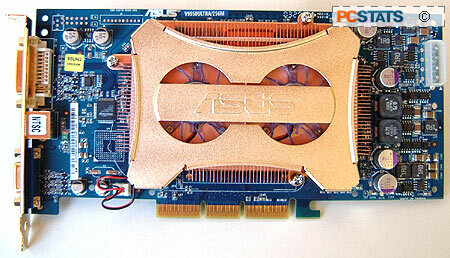 Instead, Asus developed their own card PCB, and while it's still based on the reference design as all the rest of the FX5900 Ultra's are, it's certainly one of the better ones! Asus include AsusDVD (PowerDVD with an Asus skin/logo), a six game demo and full versions of Black Hawk Down, Battle Engine Aquaila and GunMetal games. For those of you who'd like to take advantage of dual analog monitors, a DVI to Analog converter and an S-Video-Composite cable are included in the box as well.